Everyones got an opinion on wholl win. Im not a betting man, but if Id put money down before the screening it wouldve been on the Alien. Two words: acid blood. Fans (read: nerds) have been waiting for this matchup since 1990s Predator 2, in which we caught a glimpse of an Alien skull in a Predator trophy case. It was the best part of a very bad movie, and was a sly wink to the 1989 Dark Horse comic, Aliens vs. Predator, which first brought the two 20th Century Fox properties together. Quick: A satellite picks up an unidentified heat signature emanating 2,000 feet below the arctic surface. Quick: Field guide Alexa Woods (Sanaa Lathan), ice-climbing à la Tom Cruise in MI: 2, is picked to lead an expedition, along with a handsome Italian archaeologist (Raoul Bova), a Scottish comic-relief engineer (Ewen Bremner) and a crack team of expendables. Quick: Billionaire Charles Bishop Weyland (Lance Henriksen, Bishop in Aliens), walking a metal catwalk with an ear mike like a member of Janet Jacksons Rhythm Nation, informs them that an ancient pyramid has been found down there. Quick: Hey, theres a giant hole dug 2,000 feet through the ice! And it wasnt there yesterday! To its credit, AVP doesnt take itself seriously. It borrows heavily from its own franchises (the Alien female heroine, the Predator 2 ending), as well as more recent movies (theres a Matrix-like slow-mo camera spin around a flying Alien embryo), and most of the dialogue is winkingly laughable. What are those things? the handsome Italian asks of the Aliens. You tell me — youre the pyramid expert, the pretty field guide answers. But its a sugar rush of a movie. It begins quickly and ends quickly. (The studio claims a runtime of 101 minutes, but the actual story — without credits — isnt even 90 minutes.) The explanation for the pyramid is lame. And why are Predators in the Arctic anyway? I thought they liked heat. Humans are mere pawns in this battle, and the movie treats them similarly. They arent even caricatures anymore; theyre caricature-blips. 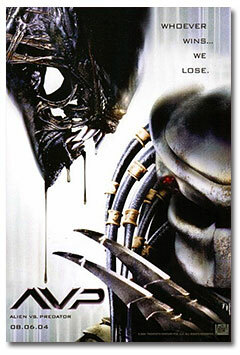 AVP will probably satisfy its fans most basic desires. But, like most sugar rushes, it wont satisfy them for long. This review originally appeared in The Seattle Times on August 14, 2004.